Phoenix 28-B effectively lubricates pipe and pipe gaskets for safe and efficient assembly of all pipe except potable water pipelines. A soft, non-water dispersible paste, Phoenix 28-B is a stable blend of vegetable oil, soaps and surfactants. 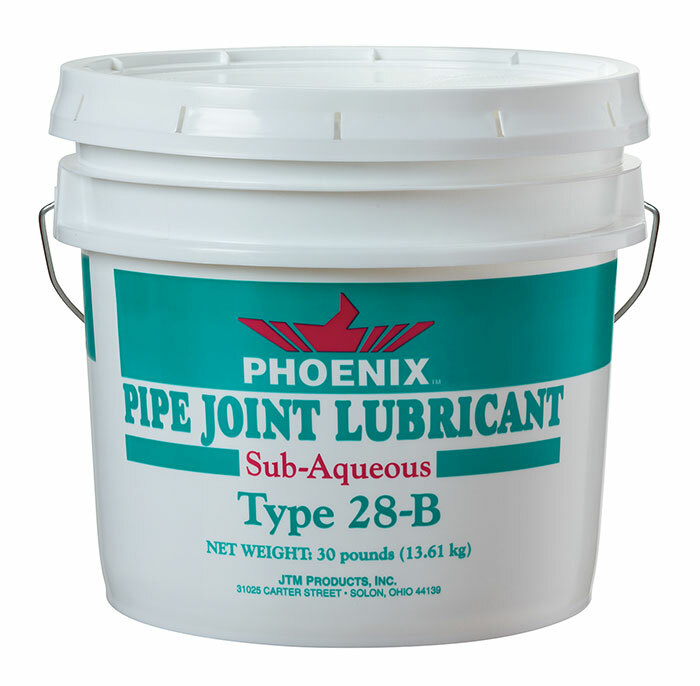 Formulated to be a slow rate of solubility formula, Phoenix 28-B will not wash off pipes or gaskets under the harshest of weather or job site conditions. Phoenix 28-B is a non-hazardous lubricant. Mating of abutting pipes forces the paste into cavities, thus providing the needed lubrication to complete the coupling and seal of the joint. Phoenix 28-B utilizes environmentally friendly raw materials common in the lubricant and soap industries. Phoenix 28-B is formulated without petroleum products and is phosphate free. It will not swell gaskets. Phoenix 28-B is non-toxic.